How to identify Economy Light fares, or more generally, the booking class, on Skyscanner? The second one is served by KLM which if we look on their website we can see that for a flight Cartagena - Amsterdam - Bucharest, if it is Economy Light the checked-in baggage is not included but it is included for Economy Standard. 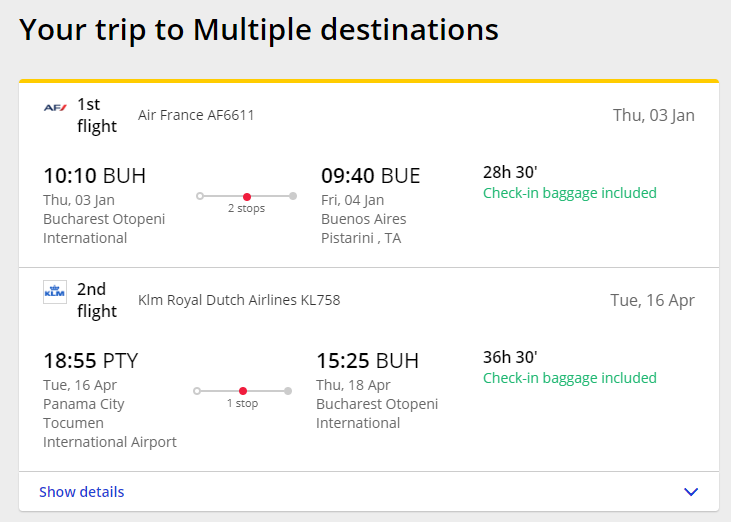 How can I check which option is shown by skyscanner? I'm pretty sure it's Economy Standard. In general, Skyscanner biases towards showing the lowest price for any flight/itinerary, so if this weren't an overseas flight (and you were just buying Cartagena - Amsterdam), I'd guess you'd get Economy Light. However, clicking through to the link on eDreams, I see that it says Check-in baggage included, suggesting it's Economy Standard. Usually, airlines are a lot more generous with their long-distance international flights, given they're the most profitable! Not the answer you're looking for? Browse other questions tagged air-travel luggage flight-search-engines or ask your own question. When booking elsewhere, how do you know what Virgin Australia ticket type you will get? Airline and Travel Agent disagree on baggage allowance, who do I need to resolve it with? Will my luggage be checked all the way through on a Bristol → Amsterdam → Singapore → Perth itinerary? Lufthansa: personal item or not? Is it possible that no baggage is free for a flight?